City dwellers breathe new life into a 105-year-old Neo-Georgian residence. Previous owners painted teh walls a pale-yellow. By changing the color to a soft white, the rich wood trim and floors shine. Perfect for entertaining, the dining room's round dining table and floral chairs add a contemporary flair. 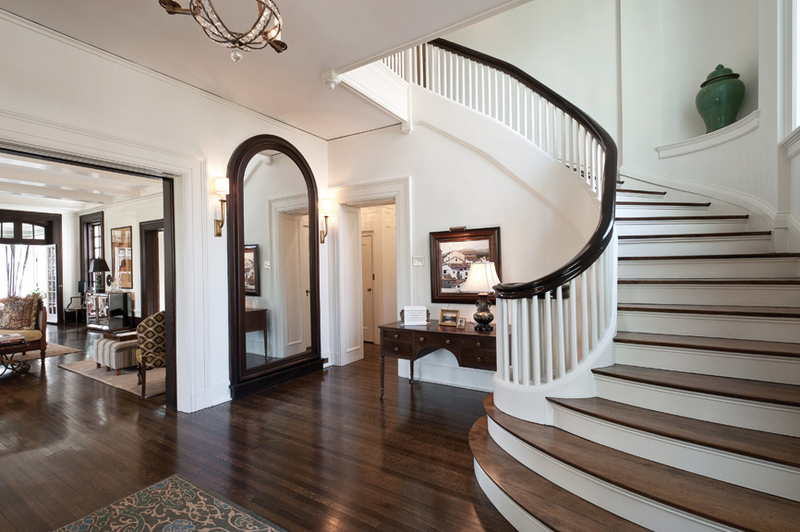 Original to the home, the grand staircase and mirror in the enterace convey the historic charm of the home. The owners enhanced the outdoor livability by adding a rectangular pool as well as a pergola and patio off the sun porch. The light and airy ktichen allows plenty of natural light to spill into the space. 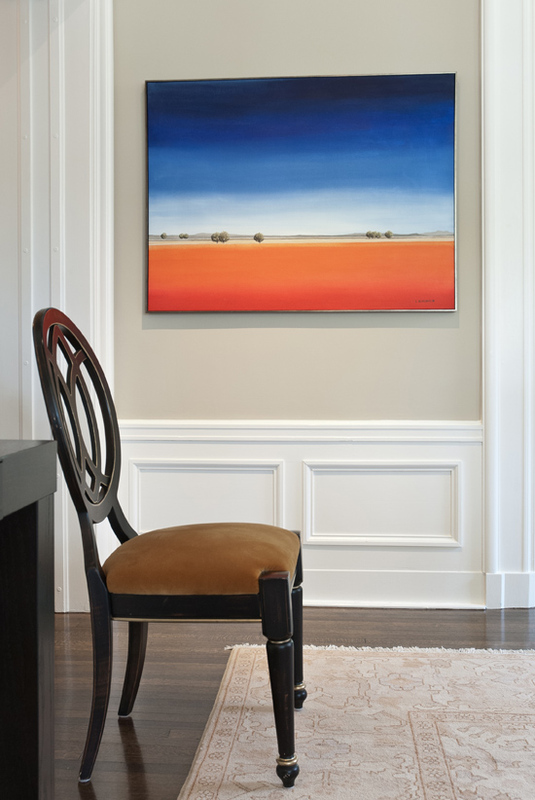 A pop of color is infused into the beige dining room whit the addition of the bold landscape painting. Since 1908, I have made my home in the cultural hub of the city in the Central West End, minutes from shops, restaurants and the famed Forest Park. While my inhabitants have come and gone, my core and structure have remained intact. Sure, owners have nipped and tucked me over the years, but isn’t everyone always in need of a little paint and personality? And sure, I’ve grown in size, but who doesn’t add on a few extra rooms in 105 years. What matters is that my bones are intact, and each of my owners has taken great care to preserve me as best as possible. I arrived on the St. Louis scene four years after the city hosted the World’s Fair. Notable St. Louis architect Louis LeBeaume, who was part of the design staff for the World’s Fair, and his firm Mariner & LaBeaume designed me. Mariner & LeBeaume were known for building homes that were historic yet modern for their time period. Other well known LaBeaume designs include the Kiel Auditorium, the Downtown YMCA and much of Lindenwood University. Designed in a neo-Georgian style, LaBeaume sought to create me as a home with a symmetrical, rectangular layout. My brick façade, which has been tuck-pointed through the years, is characteristic of my neo-Georgian style. I’m topped off with a slate tile roof, which was replaced but matched my original appearance. Throughout my 105 years, I have had the pleasure of being the home to six different families. My walls hold many memories, secrets and stories of St. Louisans pasts. My fourth family upgraded all of my systems so I could function more effectively. They also expanded the kitchen and gave me new windows, which help them better enjoy the sceneic view I provide of the yard. Despite the upgrades and changes I have undergone, my owners have retained my original floors, doors, hardware, staircase, windows and the mirror in my foyer. These retained elements add to my historic charm. My current owners cherish my city location. My location allows them to walk practically everywhere… to restaurants, dry cleaning, doctor appointments, the movie theater, etc. They thrive off of the vibrancy you experience in the city. I always hear them praising the diversity they feel in the neighborhood and how much all of our neighbors also embrace the city mentality. City living not only provides them tangible benefits, but the sounds of the city provide them with a connection to their town that you don’t always feel in the suburbs. Our yard and home is constantly filled with the sounds of races in the park, music festivals and of course the daily traffic that keeps the city operating. I was in fairly good shape when my present owners bought me, but they have refreshed my appearance and made me their own. The biggest change was not my inside appearance, but my outdoor look. Previous owners had my landscape very natural and full. My current owners appreciate a more tailored look. They removed most of my existing landscape and replaced it with well-trimmed bushes and shrubs. Tehandon Landscaping maintains my manicured look all year long. In addition to a new look, my owners also enhanced my outdoor livability by adding a rectangular pool by Pool Specialists, as well as a pergola and patio off my sun porch. Mainline Architects designed the pool, pergola and landscape, while W.T. Bequette Construction and Matrix Construction built the pergola and patio, respectively. My outdoor living area is the ideal place to beat the St. Louis summers. Whether taking a dip in the pool or relaxing in the shade of the pergola, my owners love being outside. The calming sounds of water from the fountains on each of my patios only enhance their outdoor experience. Heading back indoors, my owners painted and polished me up to better fit their personal style. In the kitchen, previous owners had spruced up my guts by replacing my cabinets, and windows and replacing the original floor with varied sized tiles in gray. With the goal to create an updated yet classic black and white kitchen, my current owners worked with Voss Spray Painting Co. to have my lower cabinets painted a soft white to match my uppers. Previously, my upper cabinets were white and my lower cabinets were a cherry wood. The result is a light and airy kitchen with lots of natural light spilling across the floors and countertops. 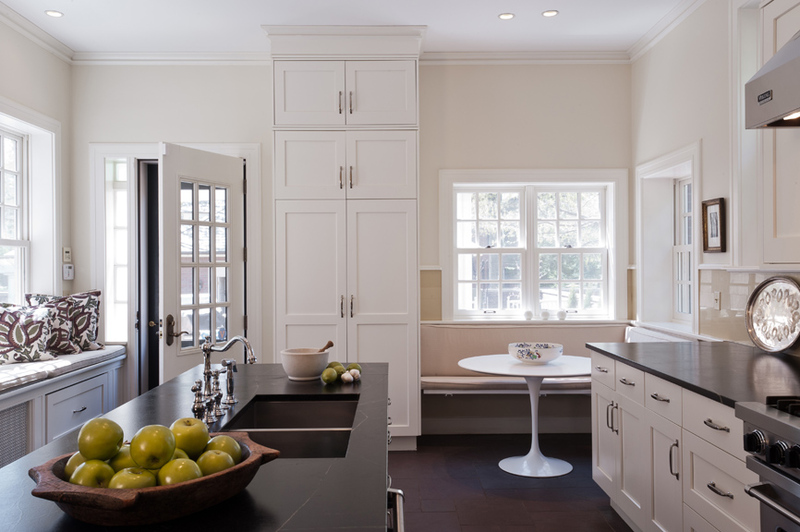 Black soapstone with creamy white veins from Stone Fabricators replaced the existing green tops. One of my owner’s favorite additions to the kitchen is the soapstone cook top backsplash. The pop of black against the stainless steel hood and appliances really makes a dramatic statement. My off-white vitrolite backsplash is original to the home. Working with Vitrolite Specialists, my owners took great care to preserve me as they renovated the kitchen space. An eat-in breakfast area was previously part of the back porch where daily ice and refrigerated deliveries were dropped off. The quaint dining area includes a built-in bench covered in natural beige fabric. Opposite the breakfast area is a built-in window seat, which provides the perfect view into the backyard pool area. 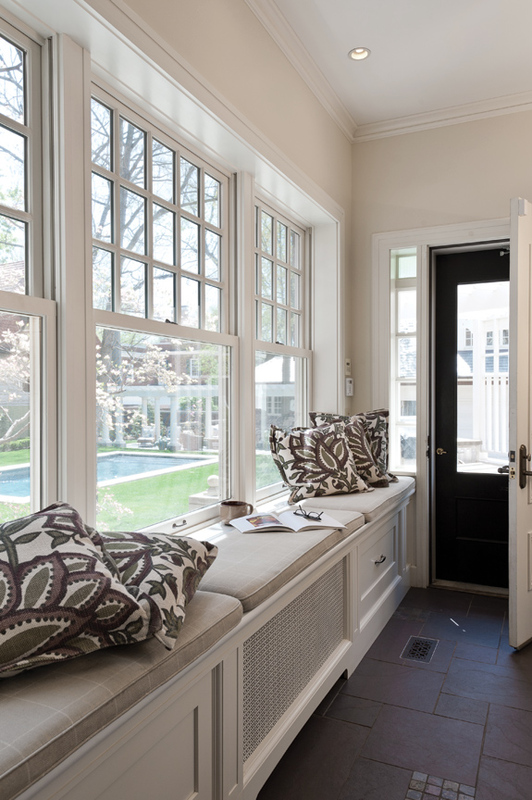 The window seat is the ideal place to curl up with a cup of coffee and a good book. A cleverly placed butler’s pantry divides the kitchen and the dining room and houses my owner's serving pieces. To further separate the spaces, a custom door matching my other doors was created to close off the dining room. By removing a built-in bookcase unoriginal to the home, a bay window could be opened up to provide natural light and another quaint view of the yard. 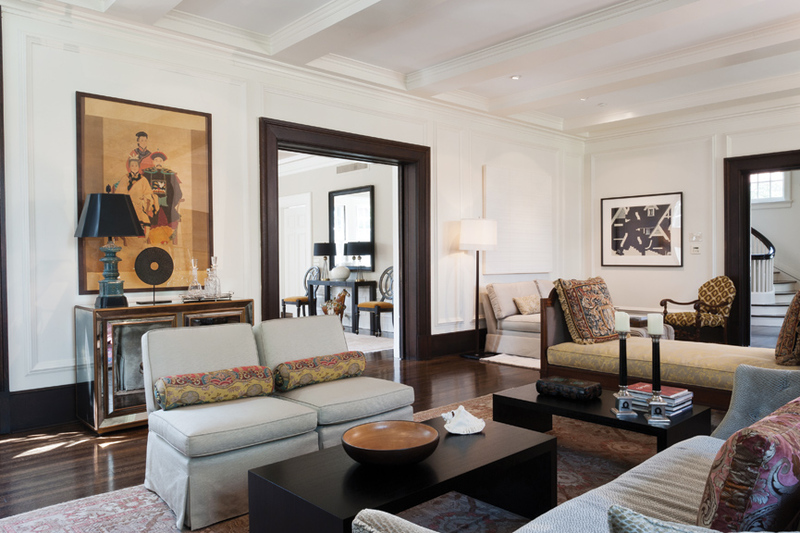 The beige walls are offset by a slightly deeper beige ceiling, which the owner intended to make the space “sparkle.” White trim and a white mantel pop against the walls. A clever idea my owner had was to place a marble top on the radiators on the first level of the home. The dining space opens directly into the living room, which makes my layout practical for entertaining. My living room walls were previously painted a pale yellow. By changing my color to a soft white, my rich wood trim and floors really shine. My floors were previously finished in a blonde tone, but my current owners wanted something more sumptuous, so they had them stained darker. You know I’ve been around for a long time when my owners were told my floors could not be stained anymore because the wood had been stripped nearly to the core. Unique and beautiful rugs by Halbert Rugs frock my rich wood boards. I don’t like to be covered up, so all of my owners have forgone window treatments. Who would want to cover up the beauty of my intricate woodwork and trim? 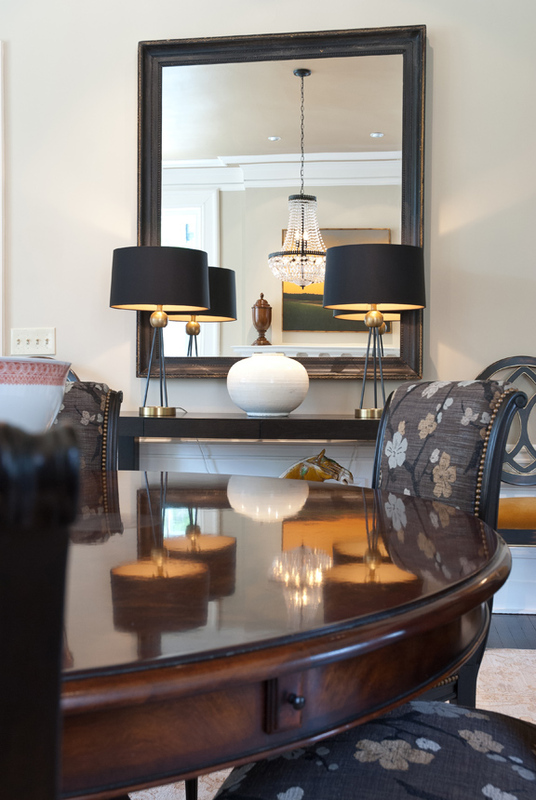 My owners love the natural light that spills into every room of the home. Throughout my 105 years, each of my owners has taken great care to preserve and never compromise any of my original details. My current owner has been very cognizant of updating aspects of the home, while still keeping my historic value. Their care and attention to detail is why I have been a staple in the Central West End for over a century. As time passes and my owners come and go, my structure and history will hopefully remain for centuries more.